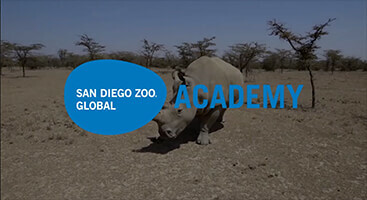 The San Diego Zoo Global Academy continues to innovate in online training for zoo and aquarium professionals. However, many times, blending online training with classrooms, books, and live instructors will help create a winning training strategy. 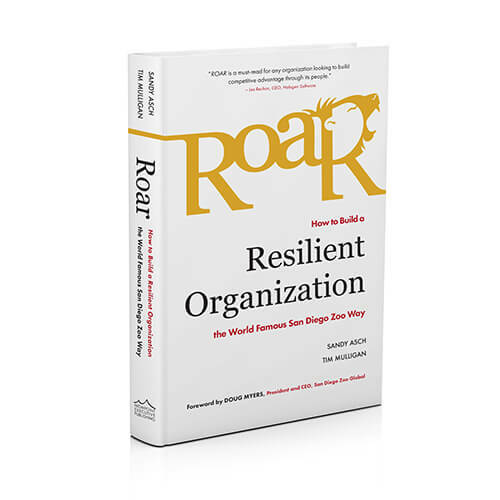 In our last newsletter, we revealed that San Diego Zoo Global has a new book, Roar: How to Build a Resilient Organization the World-Famous San Diego Zoo Way. This month, we want to share more about the book; and we invite you to reach out to us, if you would like to get your institution's name on an interest list for training opportunities related to the processes and programs shared in this book. To add your institution's name to the interest list, please send an email to Steisha Ponczoch at sponczoch@sandiegozoo.org. 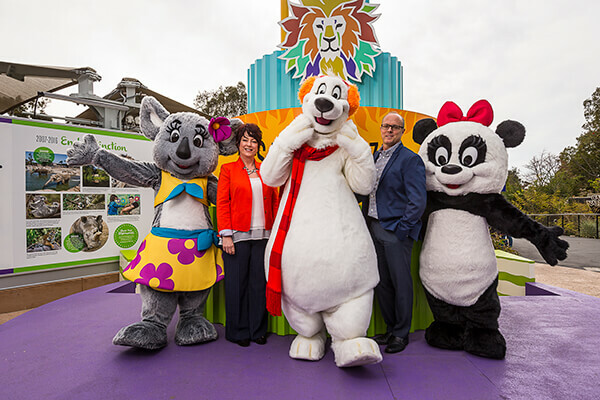 Authors Sandy Asch and Chief Human Resources Officer Tim Mulligan offer insights into San Diego Zoo Global's 100 years of resilience, innovation, and leadership. In their new book, ROAR: How to Build a Resilient Organization the World-Famous San Diego Zoo Way, San Diego Zoo Global Chief Human Resources Officer Tim Mulligan and co-author Sandy Asch look at the Zoo's high-performance culture, and how any organization can follow the Zoo's example to achieve exceptional influence and success. In ROAR, Mulligan and Asch for the first time reveal the strategies the Zoo has implemented to get where it is today—creating a world-famous animal park, and then expanding on that legacy to become an influential global conservation organization. Published in conjunction with the Zoo's ROAR-themed centennial celebration, this book offers readers new concepts in resiliency and business management, illustrated through years of great leadership at San Diego Zoo Global. It's a road map of creative, proven ideas. Featuring real-world behind-the-scenes stories, best practices, and specific strategies, this unique and valuable resource will help organizations of any size and focus to master winds of change, overcome stress and adversity, thrive in times of chaos, remain constant in pursuit of their vision, and accomplish extraordinary things—just like the San Diego Zoo. Using an innovative five-step Resilience at Work™ model, ROAR offers inspiration and actionable guidance for how to attract the best employees through integrity, respect, enhanced well-being, and happiness, resulting in superior performance. It shows leaders how to unleash the full potential of their teams to create lasting organizational resiliency. It also reveals how San Diego Zoo Global has utilized a set of innovative programs to create exceptional leaders and engaged employees—the highly motivated professionals who have engendered its amazing accomplishments. The result is resilience with a "ROAR" of purpose and passion that drives engagement and inspires extraordinary effort in any organization. Telling the story in the context of the Resilience at Work™ model will empower organizers at all levels to pull together a strong staff, which can prevail and excel in even the most challenging circumstances. "Resilience," says Mulligan, "is a hot topic in business. Some might say it's the new buzzword, especially as it relates to financial resilience." Does it matter in the workplace? "Yes, probably more than intelligence, skill, or ambition. Resilience is the backbone of any organization." 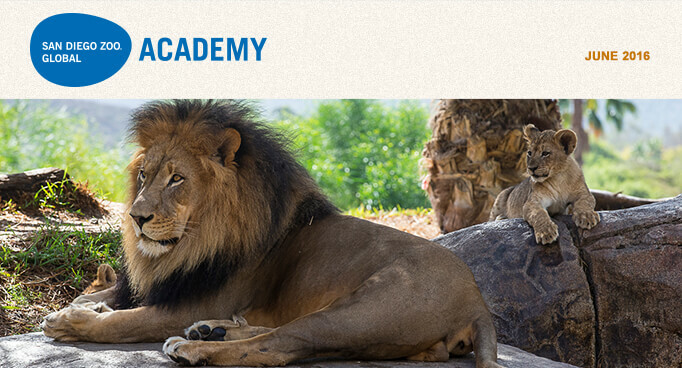 In addition to the book itself, the San Diego Zoo Global Academy is excited to announce the creation of new ROAR-themed webinar, available to Academy subscribers this summer. Rolling Out the Academy Courses to Your Staff? Developing an online training program at an institution evolves over time, as policies and processes are implemented to effectively manage the training needs and requirements of employees. At San Diego Zoo Global, we initially relied on two "big picture" memos jointly drafted by our chief executive officer, chief human resources officer, and chief life sciences officer, to inform employees about the organization's training expectations. Please note that these instructions were from the top of the organization to the roughly 600 employees whose jobs required regular physical contact with animals. 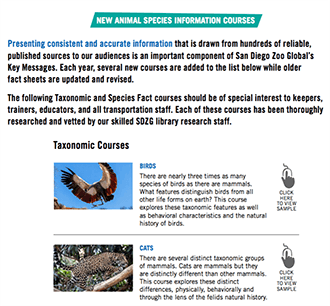 As the Academy's course list continued to grow and became more diverse, we realized that we needed a new communications tool that was more user-friendly and inviting, with a broader scope than our initial focus on animal care and management training. Early in 2016, we set out to develop a strategic communications tool that we dubbed My Academy Reference Guide. We wanted to create a tool that employees would keep and continue to refer to as they needed.Our need to communicate information about new training goals was accomplished using a more user-friendly graphic digital format, similar to a glossy brochure. Included in our e-reference guide was a dash of training program history, a reminder of original program goals, announcements of new courses, and the presentation of some next-step goals for employee training and development.With video links and vivid photos, the Reference Guide is a far cry from another memo. We created live links to courses, so the user can watch a course preview without leaving the Reference Guide. 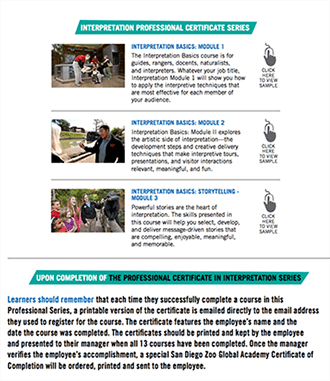 In one location, the Reference Guide clearly lists all the animal care and interpretation courses necessary to earn certificates of completion. 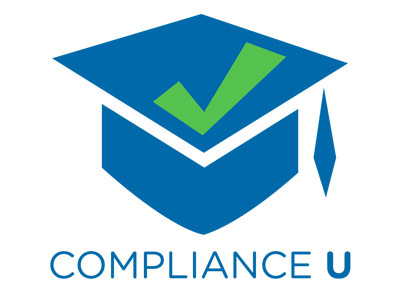 The Reference Guide has been so well received by our staff that we plan to update it at least annually, to include newly completed courses and any updates on employee training goals. If you have questions about My Academy Reference Guide, please contact Gary Priest, gpriest@sandiegozoo.org. The San Diego Zoo Global Academy utilizes real-world case studies in our courses, to enhance the online learning opportunity. The rallying cry for employees of San Diego Zoo Global is, "End Extinction!" In our 100th year, collaborating to end extinction is our mission, our focus, and our passion; and it is woven throughout our organization's strategic plan. We are pleased to share with you a video case study that features our plan and our efforts to save the northern white rhinoceros. With only three living animals remaining on the planet, we asked ourselves two critically important questions about our responsibility: "If not us, who?" and " If not now, when?" The answer to these two questions galvanized our resolve to commit the resources NOW, for an all-out effort that will harness every available new technology and coordinate the efforts of experts in every related scientific discipline, in order to succeed in a goal that will require decades of work. We hope you enjoy this behind-the-scenes look into some of the preparations necessary for bringing this species back from the brink of extinction. To check out our case study for the northern white rhino, click here. Whether you're looking for an ideal gift (for yourself or someone else) or an incentive for your institution's training program, please click here to learn more about our T-shirts! 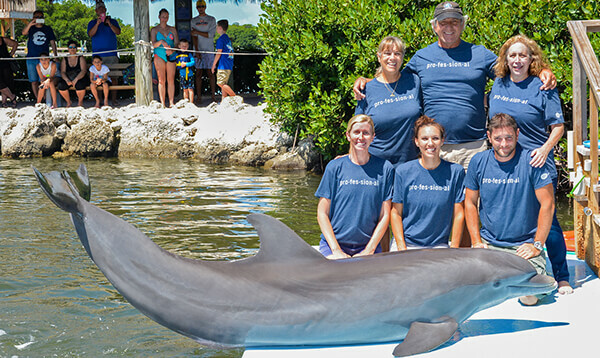 Dolphin Research Center staff members wearing their Academy T-shirts include, from left, top row: Linda Erb, Vice President of Animal Care and Training/Director of DRC Training Institute; Mandy Rodriguez, Founder of DRC; Rita Irwin, President/CEO of DRC; bottom row: Jamie Stevens, Assistant Director of DRC Training Institute; Loriel Keaton, DRC Director of Animal Care and Training; and Adam Keaton, DRC Animal Care and Habitat Supervisor—along with Pax, DRC's 19-year-old, fun-loving research star. Driving Safety Off-Road Vehicles teaches participants that defensive driving applies not only to licensed vehicles, such as cars and trucks, but also to unlicensed vehicles, such as golf carts and gators. Participants will learn guidelines for use of service carts, proper driving and operating procedures, how to carry loads, and precautions to take for pedestrians and driving at night. The Nashville Zoo is part of the Academy's collaborative learning environment! Please join us for the Administrator's Users Group Webinar hosted by Academy partner, CypherWorx. The next webinar is Wednesday, June 15 at 11 a.m. PDT. To register for the webinar, go to: https://attendee.gotowebinar.com/register/8746142581468514050. After registering, you will receive a confirmation email containing information about joining the webinar. Animal matters in the zoological world, in the wild, and in our communities generate considerable attention. The keen interest people have in seeing live animals is what draws many people to visit zoological settings. As those of you devoting your lives to care for animals daily know better than any deskbound lawyer, life in a zoological environment—as with life in the wild—is marked by challenges. Those challenges differ significantly, but they are part of the reality of life, human or nonhuman. A recent telephone conversation with a caring friend and colleague, responsible for a team of caregivers and a variety of mammals, brought one category of challenges into focus. Doing the right thing with and for animals every day—hard as it can be—is a labor of love. It is a love that I share, but the good I might do is often limited to the extent that others, like my friend, find useful value in my ideas. The reason she had reached out arose from the human dynamic of animal matters that challenges, and sometimes rocks, the marine mammal and zoological communities I have served: concerns and perhaps even criticisms pertaining to animal welfare, and whether animals other than those in dire need of rescue should be in the settings in which we lovingly tend to them. The challenge of handling concerns and criticisms is one that is worthy of ongoing examination. 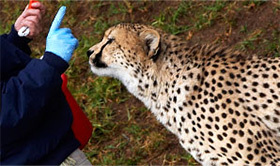 In terms of animal welfare, which is often at the heart of such discussions, the Association of Zoos and Aquariums requires accredited members to have a mechanism for reviewing animal welfare concerns—and the Excellence Beyond Compliance® approach has both an Animal Welfare Leadership Group and an Animal Welfare Officer to do that formally, informally, and even proactively. There are regular advances and breakthrough ideas, like the pioneering Five Opportunities to Thrive developed by Dr. Lance Miller and Greg Vicino, and Excellence Beyond Compliance®, to continuously improve our efforts. Animal welfare enhancements are critical, because doing our very best for animals—and constantly improving upon that—is the starting point for being able to address concerns and criticisms. Understanding the particular (or generalized) concern or criticism is essential. As long as there is mutual respect, hear the other person or persons out, and ask them to explain their perspective. Remember (and this lesson came to me from the conversation with my friend) to tread carefully on emotions and feelings. We may all love and respect animals, but we manifest that love and respect differently. In that sense, we can build on shared interests (animal well-being) and emotions/feelings (love and respect). Trying to convince another person that his or her emotions or feelings are wrong is not an effective strategy in any context. Engaging constructively, politely, and professionally—and using the experiences to learn, grow, and change—brings advancement that is otherwise foreclosed when we escalate any conflict. Changing hearts and minds—starting with our own—through our words and deeds, on behalf of animals and in how we treat each other, is the way to go. A sort of humane engagement with others, even critics, demonstrates that compassion for other living beings—human and nonhuman—is all a result of how we live through our "one heart." This month, we continue looking at water quality parameters that are so important for the aquatic animals we display. Salinity refers to the total amount of salts (inorganic ions) that are dissolved in the water. It is normally measured in parts per thousand (ppt). The salinity of freshwater is usually less than 0.5 ppt, while sea water is 33 to 37 ppt. Thus, one liter of sea water should contain about 35 grams of dissolved salts. In estuaries, the salinity can be anywhere in between, depending on the tidal effects and the amount of mixing that occurs. The salinity of water is not affected by the temperature of the water. Most fish have adapted to a certain level of salinity. Different species of fish, however, have variable levels of tolerance to salinity. Euryhaline fish are species that can tolerate wide ranges of salinity. They alternate between the different mechanisms used in both freshwater and seawater species. Anadromous fish, which swim into freshwater streams from the sea to reproduce, and then die. The family Salmonidae is an example. Various members of this family can live in waters ranging from 0 to 35 ppt salinity. The smoltification process is where Salmonidae members undergo the transition from freshwater fingerlings, to living in the ocean, to returning to breed. Stenohaline are fish that cannot tolerate wide ranges of salinity. The majority of freshwater and sea water fish are stenohaline. When evaporation of water from a marine system occurs, it is only the water that is lost. There is no major loss of salts—so, as the water volume drops, the salinity will increase. As a result, in marine systems, any water replacement for evaporation must be with fresh water. This is ideally distilled water or reverse osmosis (RO) water, which has been forced through a filtering membrane to remove dissolved solids. Properly aged tap water (with low salt levels) may be used in large systems. However, water lost by filter backwashes and tank vacuums to waste needs to be replaced by sea water to maintain the salinity level. Next month, we will look at several other water quality parameters. The Academy's Idea Hatchery is a virtual birthplace of creative online training ideas.